2014 September | Federation of North-American Explorers | Semper Parati! The Ember Days are days of fast and abstinence at the start of each season of the year. At first they were celebrated in June, September, and December; by the time of Pope St. Gelasius I (late fifth century) they were celebrated in the spring as well. It was also at this time that their observance spread throughout the Church; previously they had only been known at Rome itself. The initial purpose of the Ember Days was to thank God for the gifts of nature, to encourage men to use these gifts in moderation, and to help those in need. 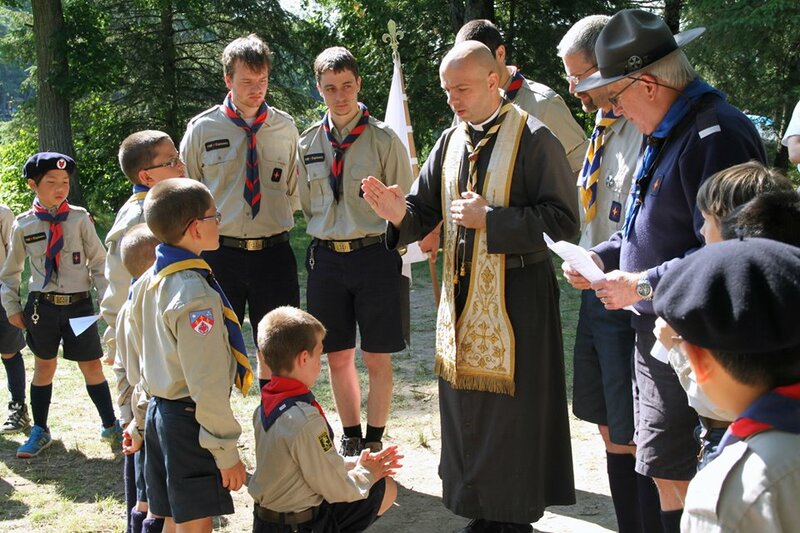 An old custom, also attributed to Pope St. Gelasius, was to ordain members of the clergy on Ember Saturday. This custom was set into law by Pope St. Gregory VII (Hildebrand) in the 11th century, at which time the dates of the Ember Days on the Church’s calendar were also fixed. One oddity of the calendar is that the Ember Days prior to summer are celebrated in the week following Pentecost Sunday, which would ordinarily be a time of feast! This shows how old the observance of the Ember Days really is (Pope St. Leo the Great that it was of Apostolic origin); it predates the custom of celebrating a major feast of the Church with an Octave (the eight days comprised of the feast itself and the seven days following it). In 1966 Pope Paul VI lifted the obligation of fast and abstinence on the Ember Days, and they were never introduced to liturgical Calendar of the modern Roman Rite. However, national episcopal conferences do have the authority to incorporate Ember Days into the liturgical calendars of their countries. What’s more, although the Ember Days are no longer on the liturgical calendar used by the vast majority of Catholics throughout the world, we are not forbidden from observing them. Today we need more penance, not less, especially in light of the many grave evils throughout the world, particularly in the countries of the FNE and those of the UIGSE-FSE of which it is a member association. One of these evils, certainly, is the lack of awareness of the dignity of the priesthood. One can find this attitude not only among non-Catholics, but also within the Church; and sadly among some priests as well, who don’t appreciate the dignity of their office. Without priests, of course, there is no Mass; without the Mass, there is no Eucharist; and without the Eucharist, there is no Church. Therefore, we want to establish Ember Saturday in September (which falls on the 27th of the month in 2014) as a day of fasting and prayer for the priests associated with the FNE. Not only for Fr. Beaugrand, our national religious adviser, but also for our group religious advisers, as well as all the other priests who have lent their support to our movement — through Mass, confessions, Holy Hours, and smaller gestures to numerous to list here. O Jesus, our great High Priest, hear our humble prayers on behalf of Your priests. Give them a deep faith, a bright and firm hope, and a burning love which will ever increase in the course of their priestly life. In their loneliness, comfort them. In their sorrows, strengthen them. In their frustrations, point out to them that it is through suffering that the soul is purified, and show them that they are needed by the Church; they are needed by souls; they are needed for the work of redemption. O loving Mother Mary, Mother of Priests, take to your heart your sons who are close to you because of their priestly ordination and because of the power which they have received to carry on the work of Christ in a world which needs them so much. Amen. Well, it’s finally time to get our group started. To that end, we will be scheduling an adult leader meeting/training session at some point during the next week or so. For those who have expressed an interest, watch your email for more details. For parents interested in FNE, we will be planning a separate session at some point during the next few weeks. Please check back here often for the announcement (or we’ll see you in person). Of course if you are interested in helping or have any questions, just email us at: AkelaAnnunciationFNE(at)gmail(dot)com. We look forward to meeting with all of you.